The DVF-EL200 Full HD viewfinder offers brighter OLED quality for CineAlta cameras PMW-F55 and PMW-F5. The compact 0.7-inch (viewable area, measured diagonally) viewfinder has the incredible clarity of 1920 x 1080 Full HD. And resolution is just the beginning. Thanks to the latest OLED technology, you get superb brightness of approximately 200 cd/m2, making it about twice as bright as the DVF-EL100, the previous PMW-F55/F5 viewfinder. The latest high quality OLED panel aids the camera operator’s ease and comfort while focusing and framing. In addition to the improved OLED panel, The DVF-EL200 features more durability and usability with an improved eye distance measure sensor, rotary encoders for controlling brightness, contrast and peaking, a heavier and more comfortable dioptre ring, rigid LEMO connector and a quick-release system to detach the viewfinder from the camera. Compatible with CineAlta cameras, including the PMW-F55 and PMW-F5. In order to use the DVF-EL200 with F55 and F5, viewfinder cables and CBK-55AT attachment are required (available separately). 1920 x 1080 Full HD panel helps camera operators focus and frame their images comfortably and easily. Thanks to the latest OLED technology, you get superb brightness of approximately 200 cd/m2, making it about twice as bright as the DVF-EL100, the previous PMW-F55/F5 viewfinder. OLED technology – a self-emitting technology – guarantees the highest contrast ratio. With no smear or blur, the viewfinder reproduces motion with high fidelity and makes it easy to focus the 4K image. 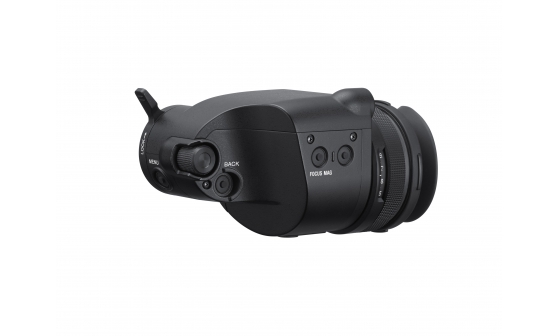 The viewfinder connects to the F55 or F5 using its durable LEMO connector. The dioptre ring is heavy and smooth to make it easier to use. It also has a scale for adjustment. The viewfinder is dust and splash resistant for more protection in the field. The viewfinder is attached to the F55 and F5 using the CBK-55AT attachment (available separately). The CBK-55AT provides a quick and easy detachable system to remove the viewfinder from the camera. The viewfinder has a rotary encoder and menu button on the inside. These can control brightness, contrast and peaking quickly and without having to open the camera menu display. The DVF-EL200 will automatically invert its OLED display when its proximity sensor detects your eye has moved away. The proximity distance is doubled compared to DVF-EL100 for improved responsiveness.